Introduction: Venice published the world's first book of gastronomy, De onesta voluptate et valetitudine, by Platina, opened the first coffee shop in the West - before any other European capital - and suggested the use of the fork, until then unknown and brought from Byzantium as part of the 'dowry' of the princess Teodora Ducas, wife of Doge Domenico Silvio. Venice was long the home of spices, of wines made from raisins, of fish in sweet and sour sauce, and dried fish. Over and above its contribution in turning simple cooking into a gastronomic art so refined as to adorn a Doge's table, Venice's traditional folk dishes should not be overlooked with their delicious offerings, many of which can still be found. 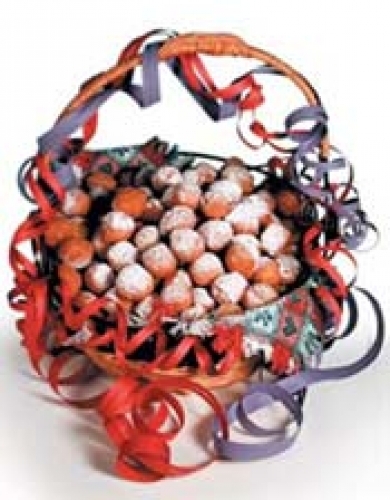 And seeing that it is Carnival time, we suggest a recipe for those popular little chestnut-shaped cakes, castagnole. Preparation: Add the eggs, sugar, salt, melted butter, and grappa to the flour and baking soda, and the yeast freshly diluted in water. Mix by hand; roll the pastry, cut out the chestnut shapes and flatten slightly. Cover and leave to rise for half an hour. Fry in plenty of oil, drain and leave to dry on absorbent kitchen paper, then sprinkle with icing-sugar. Serve hot.